After last year’s 100th anniversary of the Girl Scout Cookie Program, troops in Middle Tennessee will bring back the popular Girl Scout S’mores cookie. 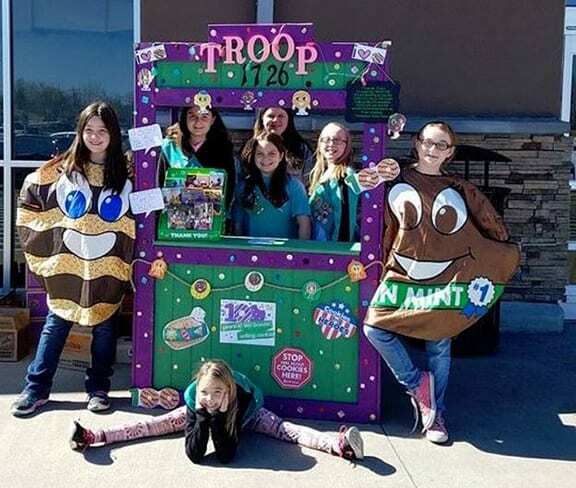 NASHVILLE, TN — Girl Scouts in Middle Tennessee are setting goals and developing business plans for Girl Scout Cookie Season, which begins December 26. The 2018 Girl Scout Cookie season will kick off the next century of Girl Scouts selling cookies. After last year’s 100th anniversary of the Girl Scout Cookie Program, troops in Middle Tennessee will bring back the popular Girl Scout S’mores cookie. The Girl Scout Cookie Program is the largest girl-led entrepreneurial program in the world. Girls as young as 5 years old begin learning and practicing essential life skills: goal setting, money management, people skills and business ethics. One hundred percent of the net proceeds go back to councils and troops to fund activities and Take Action projects. These projects are led by girls and provide sustainable, long-term impacts on their communities. In Middle Tennessee, Girl Scouts have used cookie program revenue to do amazing things, from raising funds and plugging back into other local nonprofits, community projects such as assembling and handing out bags of essentials for the homeless and income restricted, summer camp outdoor adventure experiences, to traveling overseas for a once-in-a-lifetime adventure to visit our Girl Scout locations. Cookie program revenues also make it possible for Middle Tennessee to maintain camps and properties, and reach girls in hard-to-serve areas. Girl Scout S’mores, as well as the traditional favorites, will be available through pre-order taking starting December 26 and will be purchasable from booth sales beginning February 4. Prices will remain $3.50 for traditional favorites and $5 for S’mores. Local cookie sales benefit Girl Scouts of Middle Tennessee programs and troops. For more information on this year’s Girl Scout Cookie Program, visit http://gsmidtn.org/cookies/. Girl Scouts of Middle Tennessee serves more than 14,000 girls and 6,500 adult volunteers in 39 counties. It is a part of Girl Scouts of the USA (GSUSA), the world’s preeminent organization for girls, with a membership of more than 2.6 million girls and adults nationwide. GSUSA continues to strive to build girls of courage, confidence, and character, who make the world a better place.